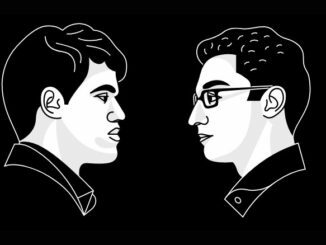 HomeWorld Chess ChampionshipCarlsen vs Caruana 2018World Chess Championship 2018: Game 4 Sees The Quickest Draw So Far. Carlsen Fails To Get Anything As White. World Chess Championship 2018 taking place in London, United Kingdom, between November 8th and 28th. Game four is a limp fish and sees the World Champion completely muted in the English Opening. Caruana suffers a Social Media mishap. Hi there dear reader! It is game 4 day here in London and we press are settling into a routine. When it comes to this World Chess Championship, it begins with queuing outside the venue and begging to be let in so we can do our jobs. I hate to bellyache, but, it is reaching the point of lunacy now as we get here nice and early to get set up, start our articles, get our accreditation (a process that we have to go through anew every day for some reason) all in time to be taken to the playing area around 20 minutes before the start of the round. Every round so far, myself and colleagues like Mike Klein, Ian Rogers, Leontxo Garcia, turn up nice and early in order to go through accreditation, security checks, and get settled in the press room. Then it is time to get the laptops out, do our camera checks, put the starting touches on our articles, and, perhaps hydrate and freshen up a bit before it is all systems go. And every time so far, we are told by security, “…not until two O’Clock.”. In other words, when the doors open to the steady stream of spectators, we can also get in. Now don’t get me wrong, it’s not like we class ourselves as VIP’s and expect the World, but we have a job to do and you can not imagine how much this impedes us. Letting us in at the same time as the public, who also have to have their bags checked and collect their tickets, is just totally unworkable. It cuts our preparation time drastically. Considering that the game will start at three and we will be escorted to the playing area around twenty minutes before, it turns a nice relaxed, organised, method into a rushed, stressy, catching up session. Having begged and pleaded, (and Mike Klein almost getting treated like a CNN reporter at the White House before round four), I do hear that this will be sorted out for round five onwards. I do hope it is true, or we are in for a very long tournament. Ok, to the chess then and Magnus Carlsen had his second White game of the Championship for Game 4. It is important to bear in mind that this means that Magnus will have White twice up to the halfway stage of the Championship. I think it is fair to say that the players will want to strike somewhere in the first six games, don’t you? I am now having to stop to be taken to the playing hall for the start of the round, so don’t go anywhere, I’ll be right back. 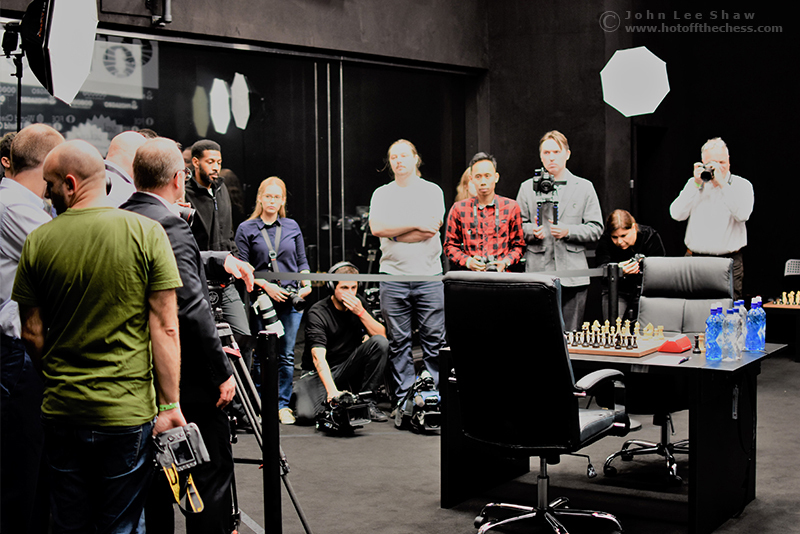 How many photographers can you get nicely around the start of the game that could decide the World Chess Championship … ? Not Many! As you can see, the working area is rather confined, you can see the glass screen that separates the players from the audience and in front of this is a ‘V’-shaped cordon, that we have to stay behind. At the point of the ‘V’ is the live feed camera that we have to keep clear and can’t walk in front of. We also can’t walk around the table to get to the other side of the ‘V’ once the players and VIP’s are there. This means, that should you be lucky enough to find a good place, you get there and are very often stuck there. Unless you can get somewhere near the live feed camera (which I have not been able to yet as I tend to be one of the last groups of three to go in) then you have to pick one player to photograph. 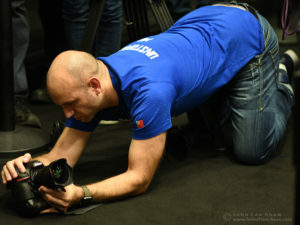 Honestly, for a World Chess Championship, (where you would think good photographs being circulated in reports would be a welcomed thing for the organisers), it really is like having one hand tied behind ones back. Where this round was concerned, I am afraid that I just was not quick enough and wasn’t able to get any quality photographs. All mine were blurred from nudges, or had other lenses or people’s shoulders, heads, even an elbow in them. This is not the fault of my colleagues, dear reader, who barring a few are extremely cooperative and respectful. Most will even stand aside to let others get a few shots off. Chess journalism is actually a very nice, family-esque, field and I have met a lot of nice people and made a lot of valued friends. Yes, people have their angles and protect their stories and scoops, but that is only to be expected and is a good thing in the interests of originality and competition. There is also a lot of cooperation and camaraderie involved — especially when we were all made to wait out in the rain a couple of rounds ago. Unfortunately, though, we can only work with what we are given by the organisers, and at this event it is a round-by-round lottery. I will do my best and try my hardest is all I can say. It is impossible for me to take this at all personally, it is just how it is and we are all in the same boat. You will notice in the above photograph, that renowned photographer, David Llada, (back to the camera in the greenish tshirt), was in a great position to shoot … the back of a chair … for this round. Unfortunately for David, he was one of the last in and being the professional that he is, is having a very frustrating time. Actually, he has to sink rather low to get a photo sometimes…! How many positions does a chess photographer need in his repertoire for London 2018 …? David Llada demonstrates one of his novelties at the start of round 3. This means that Magnus Carlsen will actually have three Whites in four games. Perhaps, then, this is why he shot a blank in this round. In fact, to say that he shot a blank is perhaps saying too much, it was more like he didn’t even pull the trigger. The World Champion got absolutely nothing from his English Opening, which honoured the location, but let its purpose down quite a bit. Magnus actually took someone to task in the press conference later on, when it was referred to as the English ‘Defence’. 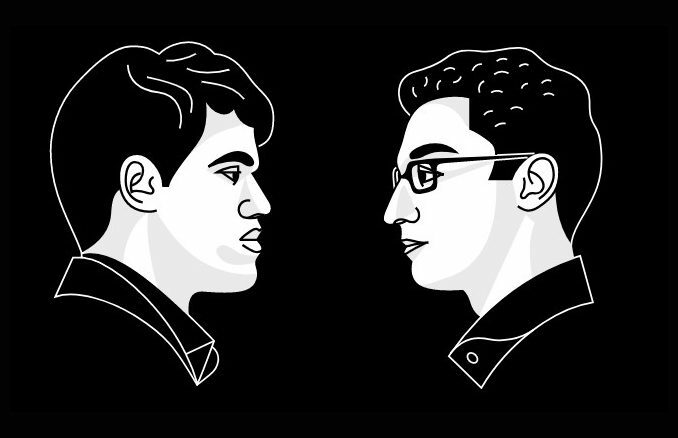 Carlsen said that he felt that the gentleman asking the question was doing a discredit to the opening by incorrectly referring to it as a defence. And as an English Opening player myself, I whole-heartedly agree with him, it can be extremely spicy. However, in all fairness to the gentleman, he could well have seen a lot of games like this one, in which case it is an easy mistake to make. I can’t imagine that Magnus will be anything but annoyed at this game. He will feel that he has wasted one of his bundle of White games. I know that he plays both colours with the same intent to win; but, White undeniably comes with an advantage. One is having a move in hand, but another is leading and steering the game’s route. In this game, I felt very little direction from Magnus and that surprised me. Of course, part of that could have been that his opponent did not allow him anything. Fabiano Caruana certainly came well prepared and if Magnus was playing for anything, he certainly didn’t get it. He admitted afterwards that Caruana has out prepared him as Black so far, but said that he will have to, “…try harder.”. Much harder. The players now have their second rest day before playing games five and six to take us up to half time. That’s one White each. I heard some spectators speculating yesterday, that Magnus is playing solid and going for the play-off’s because he is better at faster chess. To be honest, I don’t think Magnus is this naive and I know he is much more proud. I think he wants to retain his title outright. Especially against his closest rival. Carlsen has had the demeanour of being ‘the man’, his hard stares, his boxer-like posing at times. He’s been walking the walk and now he has to talk the talk. And Fabiano Caruana, as World #2, must want to be #1. He is in this match after a shaky start, he’s keeping the three times champion at bay. There is no way that he will want this to go to the unpredictable setting of tie-breaks, either. He will want to win this match, dethroning the World Champion, the prodigy, the genius, the man, at his own game. Therefore, I feel that something is going to happen and it must happen before too long. I know that there has been criticism as to the comparative dullness of the games since the excitement of game one, but this kind of thing is bound to happen. The players have to be allowed time to feel each other out and get comfy. The problem with this is the short match of only twelve games. However, we are only a third of the way in. As I have said, I do feel that they both want to win. And win outright. Just as the round was getting underway today, the press room started buzzing with news that a video was doing the rounds on social media. Among other things, this video showed Fabiano Caruana during his training camp and included (so I am told, I have not seen it) a shirtless Fabiano playing sports and a view of emails and preparation on his laptop. The video was posted on YouTube by the Saint Louis Chess Club and was speedily deleted. However, this was not before a few people had gotten hold of it — things work quickly on social media, of course. Chess.com’s Mike Klein has the full story about this. If you would like to know all the details then I would advise you to head over there, (by clicking here) because I really could not do as well as Mike, without looking like I am plagiarising him. The questions then arise as to if the video is an accident, a deliberate leak or misinformation by the Caruana camp. I think we can rule out the latter. Fabiano was clearly unimpressed by it. Not only did he choose not to answer the question about it in the press conference; but, he seemed to enter today’s game looking a bit miffed. My feeling is that it is an accident. A deliberate leak of any kind makes no sense. Regardless, someone is going to be in a lot of trouble! This is a huge blunder indeed. 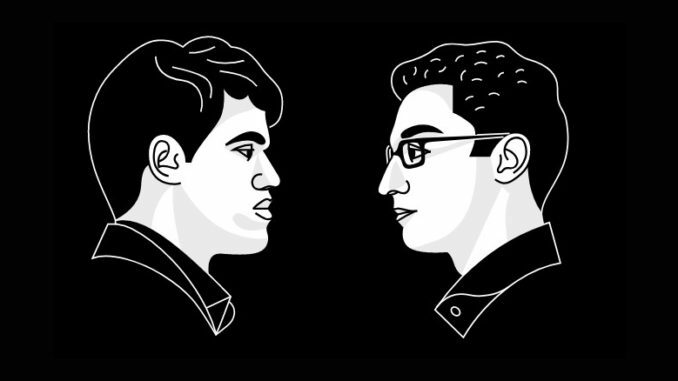 Any hot gems in there will be very valuable to Magnus Carlsen and his team and have the potential to severely damage Fabiano Caruana’s World Title campaign. One must feel for Fabiano, who was in no mood to discuss the matter at the press conference after game four. It was then Magnus Carlsen’s turn to comment — “…I’ll take a look at the video…” he stated, after a couple of semi-laughs, to much observer amusement. Carlsen, who certainly has absolutely no sympathy for Caruana’s situation, added that he honestly had not seen it, but would be watching it to see if there was anything useful in there. “We will see,” he concluded. Just what this brings for the match, will be revealed over the coming days. The good news for the Caruana Camp, is that they have Wednesday’s rest day to regroup and analyse what adjustments (if any) need to be made. In a way, it could give the match a bit of a kick, with a rather peeved Fabiano looking to unleash some of his wrath at the board. On the other hand, it could make him batten down the hatches a bit for a game or four while his team re-work his lines. That could be a red rag to a bull for a player like Magnus Carlsen. Somehow, I feel a decisive game fast approaching — but, we will see indeed! 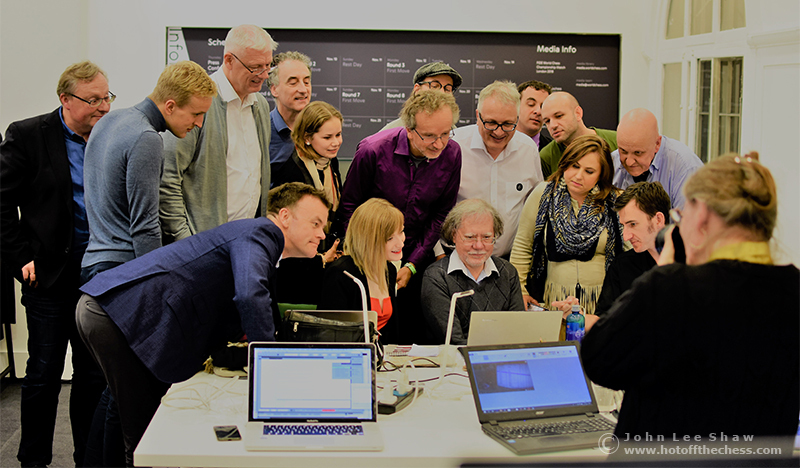 And … how many members of the chess press, can you photograph watching a viral video?